Hideo Nakata (中田 秀夫, Nakata Hideo, born July 19, 1961) is a Japanese filmmaker. Nakata was born in Okayama, Japan. 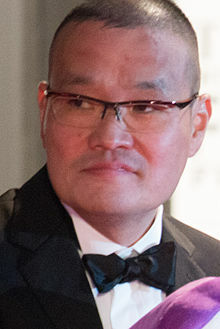 He is most familiar to Western audiences for his work on Japanese horror films such as Ring (1998), Ring 2 (1999) and Dark Water (2002). Several of these were remade in America as The Ring (2002), Dark Water (2005), and The Ring Two. Nakata was scheduled to make his English-language debut with True Believers, but later pulled out. He was later offered by DreamWorks to direct the movie The Ring Two (2005), which he accepted, making his English-language debut with a sequel to a remake of his own film. Nakata made his initial breakthrough into film with Ghost Actress (1996). Although failing to attain any large-scale success, the film was responsible for leading to his directing of Ring. Other Nakata films include Sleeping Bride (2000); Curse, Death and Spirit; and Chaos (2000). He directed the psychological thriller The Incite Mill which premiered on 16 October 2010 in Japan. He has now completed a Japanese ghost story, Kaidan. Nakata is currently working on Hearn, which is about the life of Lafcadio Hearn who wrote Kwaidan. He is represented by United Talent Agency. His film Chatroom, was screened in the Un Certain Regard section at the 2010 Cannes Film Festival. ^ Schilling, Mark (18 January 2010). "Hideo Nakata to direct 'Incite Mill'". Variety. ^ "Nakata direct Incite Mill". DreadCentral. ^ "ENOUGH of These Underground Games. Hideo Nakata, It's a Little Late". BloodyDisgusting. ^ "New Trailer: Spend Some Time in Hideo Nakata's The Incite Mill". DreadCentral. ^ "Full Trailer for Hideo Nakata's 'The Incite Mill'". DreadCentral. ^ Leffler, Rebecca (15 April 2010). "Hollywood Reporter: Cannes Lineup". hollywoodreporter. Archived from the original on April 22, 2010. Retrieved 2010-04-17. ^ "Fujiwara Tatsuya To Star In Japanese Remake Of Haunters". Japanverse. Archived from the original on 2013-07-02. This page was last edited on 2 April 2019, at 16:21 (UTC).